Confusion, turmoil, intense news coverage, huge crowds and deep sorrow ordered the day. 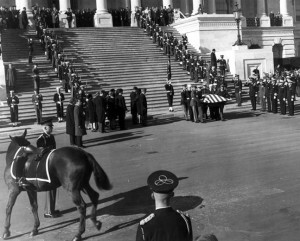 President Kennedy’s funeral and burial in Arlington National Cemetery, Virginia, was the first televised State Funeral. Dignitaries came from around the world to pay homage to the fallen President as the American people watched at home on their television sets. A nation shocked and mourning watched as a young widow, First Lady Jacqueline Kennedy, and her small children attended the service. Perhaps the confusion between Black Jack, also known as Sardar, a gift to the Kennedys from President Ayub Khan of Pakistan and Black Jack, the Army caparisoned horse, was a natural mistake; after all both horses had the same name, white stars, were bays, the same size and highly excitable. It would be natural for a case of mistaken identity to occur; the irony is so great it is almost unbelievable. Pierre Salinger, White House Press Secretary, cleared up the confusion by telling the press that the horse, Black Jack, belonged to the Army and not Jackie Kennedy. Then it fell on the Army to tell its story of Black Jack the caparisoned horse. Black Jack, born on January 19, 1947, was named in honor of General John J.“Black Jack” Pershing. The Quarter horse received his training at Fort Reno in Oklahoma. Fort Reno, an Army Quartermaster Remount Depot, procured, breed, trained, stabled and sold horses. When the Army needed horses and mules the Remount Depot supplied them; when horses and mules were not needed they were returned to the depot. Fort Reno on average quartered approximately 14,000 horses; however, during World War II the Army became mechanized and the need for horses decreased. Finally on July 1, 1948 Fort Reno was turned over to the US Department of Agriculture. The horses and mules were sold or given as aid to foreign countries. 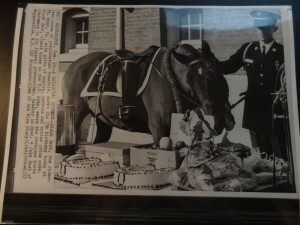 Black Jack was one of the last Quartermaster issued horses. He carried a US brand on his left shoulder and the serial number 2V56 tattooed on his neck. Black Jack arrived at Fort Myer on Nov 22, 1952 and became part of the Caisson Platoon of the 34d US Infantry Regiment (Old Guard). The horse did not do well under saddle; as an alternative, he became the riderless horse for military funerals at the Arlington National Cemetery. Even here Black Jack performed poorly; he was high strung and nervous, never getting used to the cannon fire which was a part of every funeral. 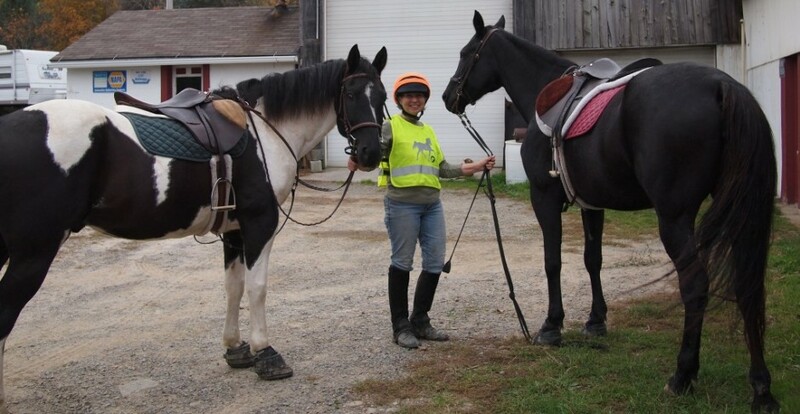 Black Jack’s handlers changed every 18 months until Pete Duda became a suitable partner for the gelding. Together they walked in more than 200 funerals. During the Kennedy Funeral thousands of people around the globe watched the caparisoned horse dance and paw the pavement behind the caisson. Black Jack captured the hearts of viewers. His high spirit and beauty caught the public’s attention and created interest in the horse. However, nineteen year old Pfc. Arthur Carlson, Black Jack’s new handler, had his hands full; more than once the horse stepped on his foot. The young man feared his toes were broken. The pair made it to Arlington National Cemetery and waited as the President was lowered into an open grave and buried. Black Jack became an overnight sensation. School children came to Arlington National Cemetery on fieldtrips to visit the horse. Nancy Schado, president of the Army Arlington Ladies, became Black Jack’s honorary “mother” bringing the horse pecan cake on a regular basis; especially for his birthday. President Richard Nixon sent the horse a birthday card which still hangs in the stables at Fort Myer. Black Jack received the attention and care of a national treasure. Black Jack grew old and semi-retired in 1973. He died at the age of 29 on February 6, 1976. Black Jack participated in the state funerals of Presidents John F. Kennedy and Lyndon Johnson, CIA director Herbert Hoover and General of the Army Douglas MacArther. The horse was cremated, his ashes placed in an urn and carried by a funeral procession with full military honors. 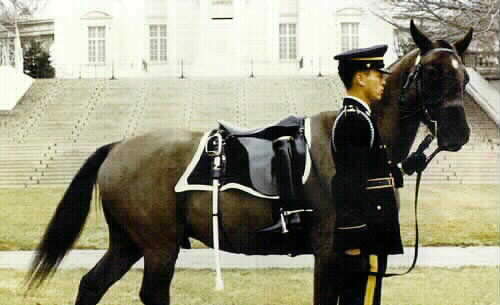 He was the second horse in US military history to receive full military honors and burial. The first horse to receive such honors was Comanche; survivor of the Battle of the Little Bighorn. Black Jack’s ashes lay in Summerall Field. His grave, marked by a monument with an attractive metal plaque, commemorates the horse. This entry was posted in Uncategorized and tagged Army Arlington Ladies, Arthur Carlson, Black Jack, Blackjack, Caisson Platoon of the 34d US Infantry Regiment, Caparison Horse, Caparison Horse Black Jack, Caparisoned Horse, Caparisoned Horse Black Jack, Kennedy Funeral, Old Guard. Bookmark the permalink.